Chinese authorities dramatically expanded a re-education camp for the persecuted Uighur minority in Kashgar, Xinjiang. These photos show the camp in February 2017 and August 2018. New satellite images show a facility used to detain China's Uighur Muslim ethnic minority in the western region of Xinjiang. 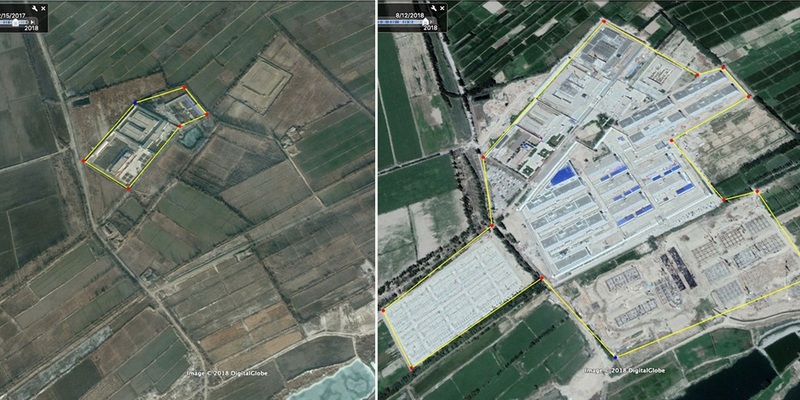 Shawn Zhang, a law student in Canada, posted images of a re-education camp in Kashgar, Xinjiang, expanded to about 11 times its size in less than two years. People say they've witnessed, and been subjected to, physical and psychological torture in camps like this. Newly-published satellite images show the rapid expansion of a Chinese facility built for the country's persecuted Uighur ethnic minority. Shawn Zhang, a law student in Canada, on Wednesday posted photos of a re-education camp in the western region of Xinjiang, where about 8 million Uighurs live and are mostly detained. Many Uighurs refer to the region as East Turkestan. Zhang's Wednesday post shows a re-education camp in south Shule, a county near Xinjiang's capital Kashgar. 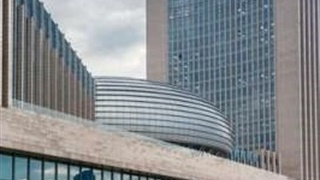 The facility was 288,000 square meters large in February 2017, and had grown to about 11 times its size - to 320,331 square meters - in August 2018, according to Zhang's measurements. Take a look at the GIF below to see the camp in February 2017, August 2017, June 2018, and August 2018. The dramatic expansion of the Kashgar camp appears to be a sign of China's growing crackdown on the Uighur people, which has seen more and more people being imprisoned in detention camps or re-education centres. Rights activists accused China of keeping 1 million Uighurs in such camps. This number may even be growing, with Radio Free Asia citing unnamed regional authorities this week as saying they have had to transfer inmates out of Xinjiang to other regions across China because "we are experiencing an overflow of inmates." Hu Lianhe, a senior Communist Party official, claimed in response that there were "no such things as re-education centers," but acknowledged that the government had detained people it considers extremists. 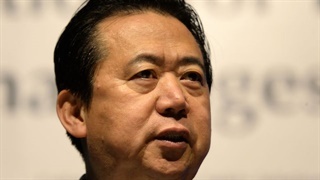 Beijing justifies its surveillance on Uighurs as a counterterrorism measure. 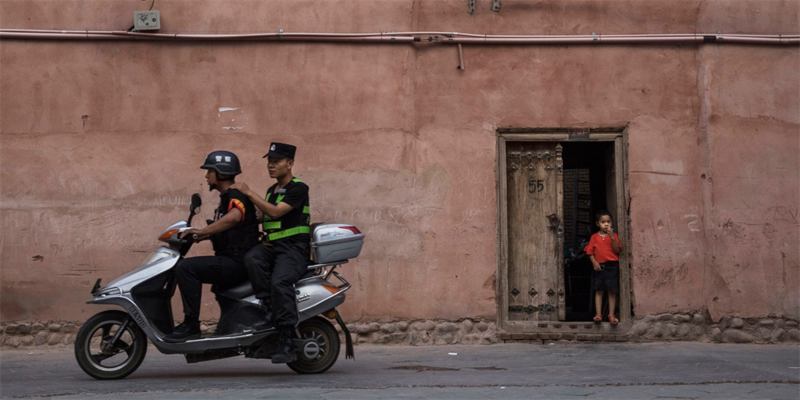 Police patrol on a scooter as an ethnic Uighur boy stands in his doorway on June 27, 2017 in the old town of Kashgar, in the far western Xinjiang province, China. Uighurs who had been inside those camps have described witnessing and experiencing physical and psychological torture, including being shackled to a chair, beaten up, and deprived of sleep. Zhang, who posted the photos, has long been critical of the Chinese state and long used satellite imagery to track and identify potential camps throughout Xinjiang. His family, who lives in China, has been contacted by police over his critical social media posts.